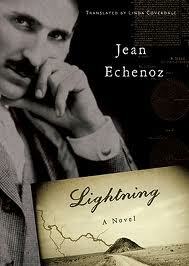 Jean Echenoz may not have been published in the UK since Piano ten years ago, but luckily The New Press across the Atlantic has provided us with a steady stream of his short novels since then: a loose trilogy centred on famous figures in music, sport and science (Ravel, Running and Lightning). 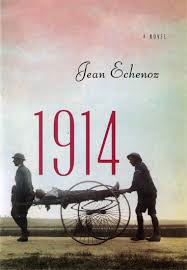 Echenoz’s latest could not be more timely (though it appears in Linda Coverdale’s translation two years after its French publication) dealing, as it does, with the First World War. The purpose of chapter 3 is to describe the atmosphere in the town after the young men have left; Echenoz does this by following Blanche through a number of settings from her room to the street outside, ending with the wonderful line: “Blanche sees only old fellows and kids, whose footsteps sound hollow on a stage too large for them.” The image works because it simply elaborates on the visual information which permeates the chapter. Like many other scenes in the novel, this continues to resonate with the reader long after the book is put down. If you intend to read one new novel about World War One this year, this should probably be it. This tone remains unchanged throughout and, despite its informality (“Let’s try to understand it, this continuous current”), its unwavering neutrality and light irony creates a sense of inevitability, as if the story were being narrated by the friendly face of Fate. I’m afraid to admit that my general knowledge of Tesla is largely limited to his supporting role in Christopher Priest’s The Prestige, later brought to life by David Bowie (in one of his few convincing roles) in Christopher Nolan’s film adaptation. This makes it difficult to verify the accuracy of Echenoz’s story – it seems, for example, a little too convenient that Tesla’s birth is signalled by a “gigantic lightning bolt” – but some cursory research suggests that it is factually correct. This makes it a little mystifying that Echenoz refers to his protagonist as Gregor throughout, and that the novel is labelled as having been ‘inspired’ by Tesla’s life. By this point Gregor’s only path is downward, his inventions ignored, living in smaller and smaller hotel rooms, with only pigeons for company. In all three of these novels Echenoz not only displays wonder at what these men achieve, but also recounts the aftermath: Ravel’s deteriorating mental abilities; Zatopek’s fading powers as a runner and the political situation that results in him working as a garbage collector. As with any tragedy, the decline somehow makes the man greater in his diminishment. Danger rating: easily digested, ideal for a sunny afternoon on the garden, there’s more to these short novels than first meets the eye. Disgracefully without a UK publisher (published by New Press in the USA), a single volume would now be ideal. Jean Echenoz’s latest novel (or perhaps novella would be more accurate) is a fictionalised account of the life of the Czech runner Emil Zatopek. Interestingly, whereas in his previous fiction Echenoz plays with narrative – from the double narrative of Double Jeopardy to the statement on the first page of Piano that the main character will “die a violent death in twenty-two days’ time” – Running is strictly chronological, almost as if the pre-existence of the story in fact makes redundant any reordering of events. Echenoz clearly admires Emil for succeeding on his own terms and in his own way. Not only does this apply to his running style, but also to his training and tactics. As Echenoz points out, Emil ‘invents’ the sprint finish by working on his speed instead of just his stamina. While the long distance runner has always been synonymous with loneliness, the modern sportsman often relies on a team of experts to support them. Emile is entirely responsible for his own success, something that Echenoz emphasises to comic effect when he is the lone Czechoslovakian parading behind his flag in Berlin. This defeat is described as a “tough break”, but further victories still follow: this not the Hollywood version where highs and lows are spot-lighted through hyperbole and symbol. Emil’s own life is not unaffected. He is, of course, a national hero, and used for propaganda purposes. At one point, however, the authorities begin to worry that he may defect and so limit his appearances abroad. His running days over, he reappears in support of the Prague Spring, and earns himself exile to a series of humiliating jobs in the years after. Echenoz’s interest in the historical background is indicated in the fact that nine of the twenty chapters begin with reference to the political situation. Running is a thoroughly enjoyable read, if at first glance little unambitious. However, it follows Echenoz’s fictionalised life of Ravel, suggesting that they may both be part of some larger project. If so, it certainly one worth following. You are currently browsing the archives for the Jean Echenoz category.